We think spring might have really sprung in Indy! Which means it’s the perfect time to start preparing for a garden. At Sprouts Cooking School, we love to include fresh herbs in our recipes and in non-food items like DIY scrubs and masks too. Herb gardening with kids doesn’t have to be difficult, and often Sprouting Chefs jump at the chance to take ownership of their own garden. As a parent, it might seem overwhelming to think about tackling a home garden with busy schedules, but children learn best through everyday experiences and a garden is a wonderful way to steer them away from “screen time” too. Additionally, a garden is a wealth of opportunity for skill growth for a child, as they have a hand in preparing, planting, growing and harvesting. Herb Gardening with Kids | Where to Start? Planning. For some this is the best part! You can browse Pinterest. Order seed catalogs. Take field trips to local garden stores, nurseries and farmers markets. Plus discuss as a family if a full backyard garden or simple porch container garden is best. Butterfly gardens are fun too, but often herb gardens are the easiest to start with, before you dive into bigger projects like full vegetable gardens or themed gardens. A few great herbs to start with: sage, basil, rosemary, cilantro, thyme, lavender, chamomile and mint (the last two are the easiest to care for and grow). Supplies. Keep it simple. Some companies even offer a starter kits. There are quite a few on Amazon – even indoor garden kits. However, for a basic outdoor children’s herb garden you’ll need are: kid-sized gardening shovel and gloves, containers (or wood border for a raised bed – there are kits for these as well), nutrient rich soil, starter plants of the herbs your family selects, markers (little chalkboard stakes are fun) and a watering can. If you are using a space in your yard, you’ll need to till or turn the soil a bit and mix in your nutrient rich soil. Planting. For the sake of keeping it simple, we say go with plants that are already started for you from a nursery or garden store. If you are starting your adventure in the winter, starting from the seedlings can be fun as well. Plot out where each herb will go before you start to dig. Make sure to mark what herb is in each space using simple plant markers or tags. Weekly Gardening. Make a schedule to check on your garden weekly. Harvest herbs. Water and weed. Your Sprouting Chef might even enjoy keeping a garden journal with design layout, notes, drawings, rubbings and ideas for next year. They may even enjoy exploring other ways to use the herbs, including oils, balms and teas. A trip to the library could come into play too, if your Sprouting Chef is eager to learn more about uses for their herbs and gardening in general. Our Carmel Clay Public Library or your own local library is a wonderful resource. Have a child that loves fairy anything? You can even add fairy garden figurines to your herb garden! Chefs, both little and big, love to add flavor to their recipes! 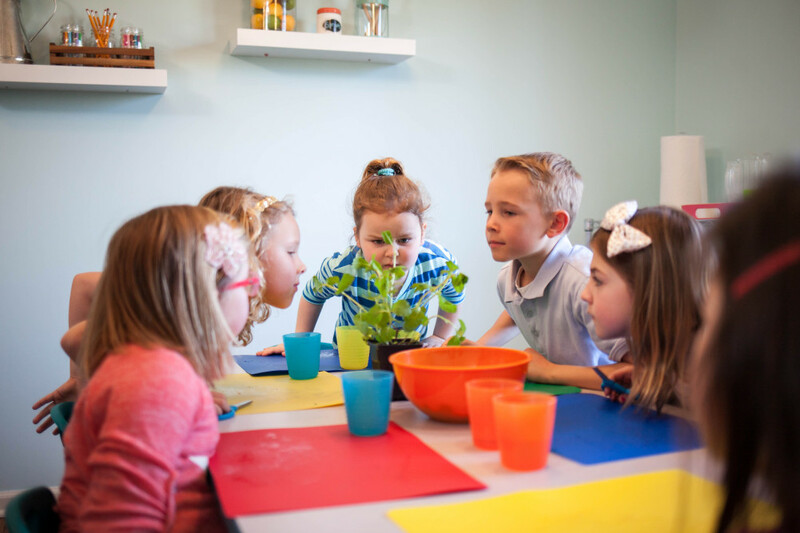 Did you know Sprouts Cooking School has 29 summer cooking camps set for 2019? Our Indianapolis area cooking camps run June – August for ages 3-13! It’s a perfect way to marry up herb gardening with kids this summer. Browse summer camps each age group below.